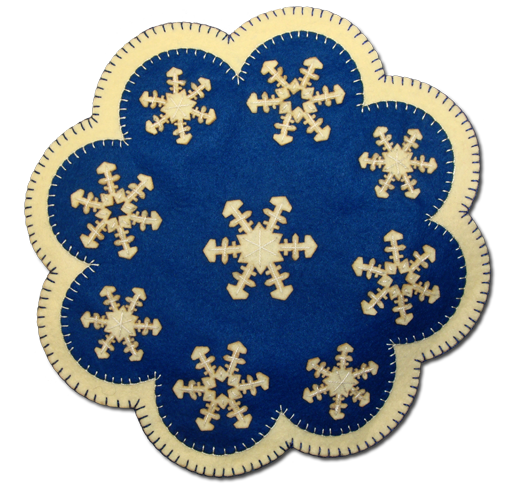 This kit makes one 93⁄4″ mat reflecting the snowy theme of winter. 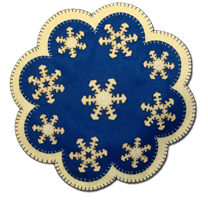 The mat is decorated with snowflakes of various sizes. It has a second set of mat base layers which surround the inner blue layer providing a very nice and thick mat. It can be used as a table decoration, placed under a vase to protect your table from scratches, or even hung in a window. This kit is made with our precision cut wool felt and includes floss, needle and instructions.